Order your own copy of Shadow of the Beanstalk at your local retailer or online through our website today! In the not so-distant future, humanity has spread across the solar system, unlocked the frontiers of cyberspace, and created millions of intelligent androids in its own image. At the heart of this progress stands a ladder leading to the riches of the stars—the massive space elevator called the Beanstalk. And at its base sprawls the biggest, meanest, and most exciting city on Earth: New Angeles. 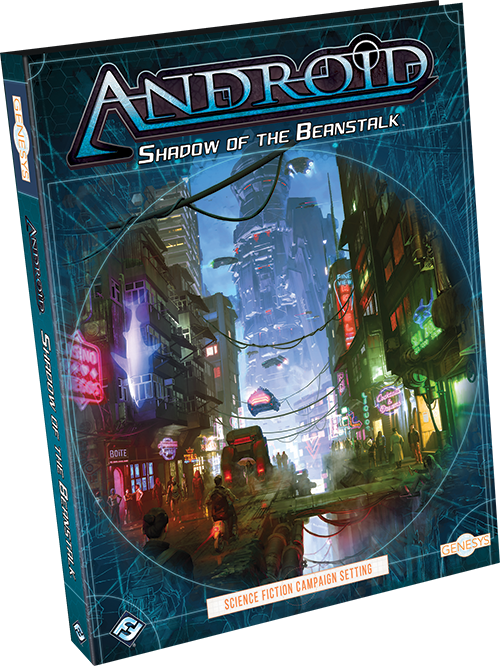 Fantasy Flight Games is proud to announce Shadow of the Beanstalk, an Android sourcebook for the Genesys Roleplaying System! Shadow of the Beanstalk is a 256-page sourcebook for use with the Genesys Roleplaying System. In this book, you’ll find new rules for character creation, new weapons, equipment, and adversaries, new rules for running the net, a guide to New Angeles, and advice for Game Masters running a campaign in the cyberpunk future of Android. 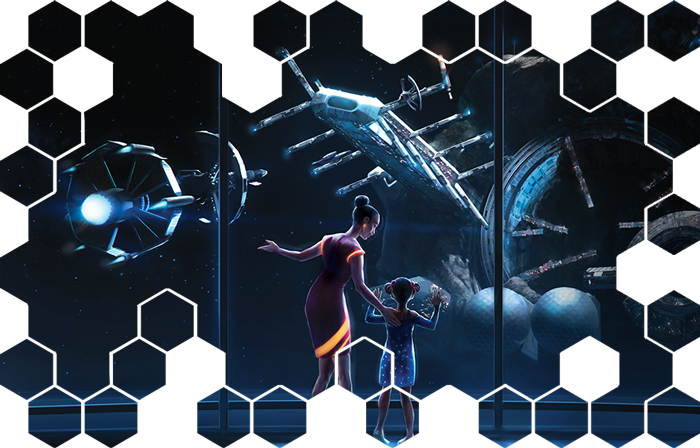 Even better, all of this comes accompanied by beautiful art and elegant mechanics that can be used in any science-fiction setting for the Genesys Roleplaying System. 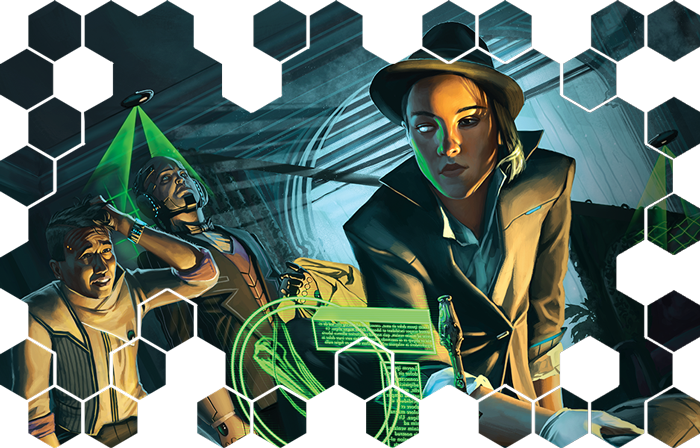 Shadow of the Beanstalk starts by redefining character creation in the Genesys roleplaying system, giving it an unforgettable neo-noir tinge. In the first part of the book, you'll be introduced to new rules as well as unique talents and skills to tailor your character to the Android setting. In Shadow of the Beanstalk, you play a (nearly) normal character living out their life in New Angeles. As a citizen of the largest and most metropolitan megalopolis on three worlds, you probably live somewhere between the ultrawealthy in their kilometer-high arcologies and the homeless, penniless disenfrancistos who live in the city’s seedy underbelly. You may have been an average person struggling to get by, a wealthy ristie fallen on hard times and looking for a big score, a roughneck working to build civilization in space, or a hard-nosed private investigator who makes their living dealing with the worst society has to offer. You may even be a criminal trying to cheat the system, or a veteran working hard to forget the war you fought in just a few years ago. Shadow of the Beanstalk gives you plenty of ways to develop a character with a storied background, but that’s just the beginning of your journey. You’ll have to select a character archetype next. Shadow of the Beanstalk offers a full set of tailored options, including Clones, Naturals, Bioroids, Soldiers and more. Each of these archetypes has access to a variety of new skills and talents that set you apart from the swarm of other citizens living in the shadow of the Beanstalk. After all, in the world of Android, having deep pockets and corporate connections are just as valuable as combat training and heightened awareness. But extraordinary skills can be exploited, and in the near-future, everyone owes something to someone. Shadow of the Beanstalk also introduces a new mechanic called the favor economy, allowing you to boost your starting credits or XP during character creation at the expense of owing a favor to one of New Angeles’ factions. Various factions constantly engage in a silent war in New Angeles, from biomedical cloners Jinteki, to artificial intelligence juggernaut Haas-Bioroid, to the NAPD just trying to hold it all together. While taking favors may provide an initial boost of power, they'll always weigh on your mind, and you never know when one of these factions may show up on your doorstep, looking to cash-in on their previous generosity. As your campaign progresses your character may even find themselves owing favors to several factions, becoming embroiled in the corporate war engulfing New Angeles. In the second part of the book, the focus shifts to fleshing out the Android setting, including complete rules for running the net! 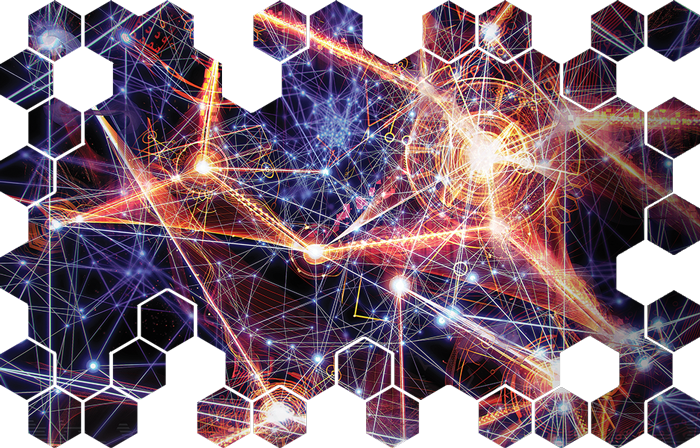 In the future, the successor to the internet helps define every aspect of daily life, linking the world to a web of data. Manipulating this network opens up great benefits, and Shadow of the Beanstalk can guide you on exactly how to do that. You’ll also find a detailed section breaking down New Angeles' various locations. Look for an example of a typical New Angeles neighborhood, as well as the various districts that make up the megalopolis, ripe with challenges and adventure hooks. You'll even get a breakdown of Heinlein, humanity's foothold on the Moon! While this gives a great background to New Angeles, the world of Android is so much bigger. 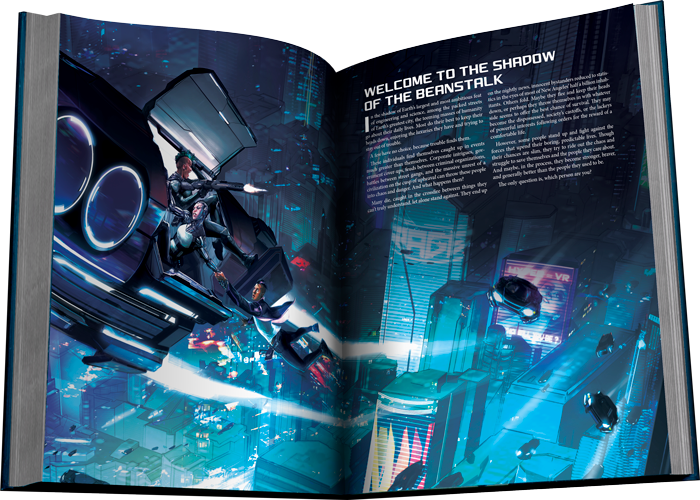 If you're interested in running a campaign set in the Android universe, an unmissable supplement for Shadow of the Beanstalk is The Worlds of Android hardcover book, which offers a complete overview of the Android setting. 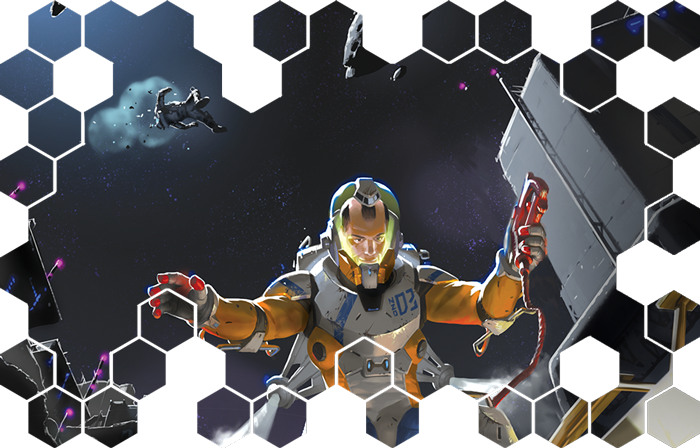 While The Worlds of Android does not have mechanical rules for the Genesys Roleplaying System, it still provides an in-depth look at every aspect of the Android universe, even stretching out to the far-flung colonies of Mars. The final section of the book the Game Master, providing a vast wealth of resrouces for your games, such as a list of adversaries appropriate to the setting. As a nexus of trade, culture, and politics, New Angeles draws all sorts of people from all over the worlds. 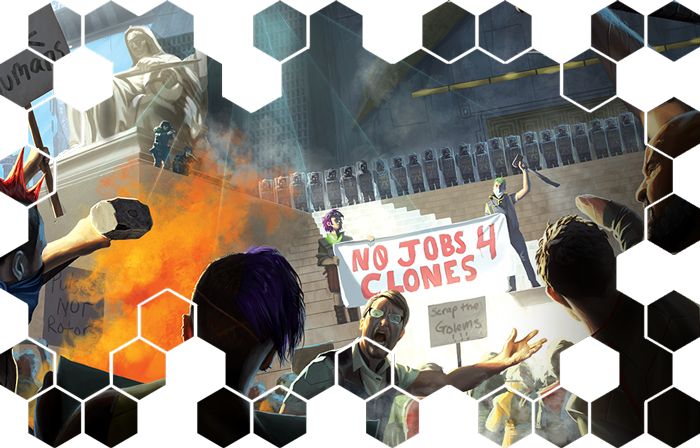 From Principled Runners to Megacorp Executives, over 70 adversaries are statted for your use in campaigns. 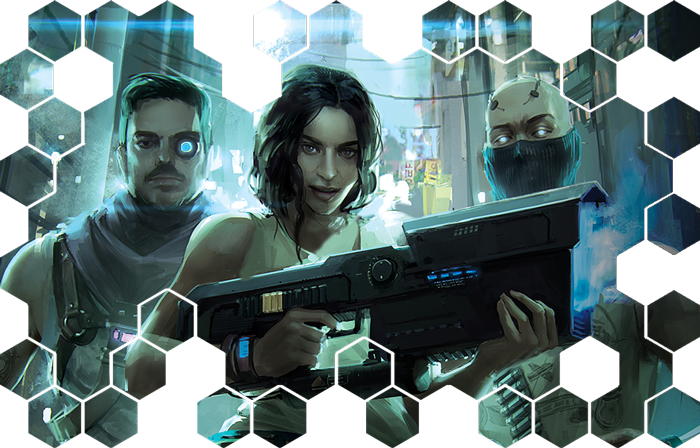 Alongside these NPCs to populate your games, you'll hack into a whole section detailing how to run a campaign in the Android setting. Running a Shadow of the Beanstalk game can be very different from running a “traditional” RPG, where wandering bands of heroes roam the countryside, cutting down monsters with swords and taking treasure. The Android universe is grounded in a certain amount of realism, and the struggles of your players' characters aren’t too far removed from our own. The characters need money to survive, and many campaigns can center around just trying to survive in a megalopolis. Within this section, you'll find advice on how to develop a living world, and how to present complex and interesting challenges to your player. Finally, the book offers a complete “Adventure Builder” that can help even the newest Game Masters to develop an exciting adventure for their players. With modular hooks, escalations, and climaxes that can be combined in any way, it's easy to produce an adventure dripping with theme and excitement. A job may start with your party hunting down an escaped clone, but may escalate when the media picks up on the story, and reach a climax when your employers decide to cover up the mess by eliminating everyone involved. Or maybe your employer becomes dissatisfied with your investigation and hires a rival gang to complete the job, only to leak the story to the press, blaming your party and your rivals for any negative consequences. Shadows of the Beanstalk gives you the tools to run a successful campaign in the Android setting—but you don't need to stop there. The information in Shadow of the Beanstalk can easily be extrapolated to your own cyberpunk setting or even stranger brands of science fiction. The citizens of New Angeles live in the shadow of the Beanstalk. While humanity has stretched its reach to the stars, most just struggle to get by. You may have exemplary skills, but in this world, standing out can get you killed. Do you have what it takes to survive the crowded streets of New Angeles? Enter a new cyberpunk future with Shadow of the Beanstalk (GNS04), available now for pre-order from your local retailer or our website!